In the real world, Silver, who had already resigned the powerful Assembly speakership he held for almost 20 years, was automatically stripped of his seat in November 2015 when he was convicted on multiple federal corruption charges. Silver’s Assembly seat was filled during an April 19 special election - a process notorious for being easily controlled by local political parties - by Alice Cancel, the preferred choice of Silver’s still-active and -influential network. Now, fewer than five months later, a Democratic primary contest between Cancel, the short-term incumbent, and five other local political and community activists will be far less malleable for the disgraced former speaker’s allies. In the heavily-Democratic district, the primary winner is all-but-certain to win November’s general election. Republican candidate Lester Chang is running again; Chang earned just under 19 percent of the vote in the April special election. While Silver’s pall will hang over the district for decades to come, this election is its first chance at a fresh start, an argument being made by Cancel’s challengers. The change from Silver has already come at a price for the district, given the immense power held by an Assembly Speaker. Cancel took Silver’s place as a rank-and-file legislator with little sway in the Assembly majority. Whoever wins this year, Cancel or another candidate, will head to Albany as a rookie legislator without major committee assignments; with little leverage to push for major initiatives’ and unable to deliver the millions of dollars in community funding Silver was so revered for in his district and derided for from outside it. Cancel, a former district leader, won the seat with the backing of the Manhattan Democratic Party, Silver’s wife, and a number of his allies. Since winning the seat Cancel has made a number of gaffes and appeared to many as unprepared to hold the seat. Normally, incumbency is seen as a major advantage, bringing with it name recognition, powerful endorsements, and a dedicated fundraising apparatus. But Cancel hasn’t demonstrated that to be the case. She drastically trails other candidates in fundraising and hasn’t had much time to establish constituent services that would allow her to ingratiate herself with her voter base. She has also underperformed in her few public appearances and primary debates. Cancel has been media shy and reluctant to campaign, though during the special election she explained that her public scarcity had to do with health concerns. The incumbent’s perceived weakness appears to be part of why five challengers hope they can marshall a dedicated base of support in what is expected to be a low turnout affair. The September 13 vote is the third primary day in New York this year. Challenging Cancel are Paul Newell, Yuh-Line Niou, Jenifer Rajkumar, Gigi Li, and Don Lee. Newell is a community activist and district leader who was the first Democrat to challenge Silver in nearly two decades, when he ran against him in 2008. Newell, who was endorsed by The New York Times editorial board, won about 22 percent of the vote with Silver at 69 percent. The effort gained Newell experience and notoriety that he hopes to capitalize on during this year’s primary. Rajkumar is a human rights lawyer and district leader who has been involved in advocacy initiatives on tenant rights, labor protections, and women in politics. She challenged City Council Member Margaret Chin in a 2013 primary and, like others running now, sought the Democratic nomination for the April special election. Li is chair of Manhattan Community Board 3 and made history in 2012 when she became the first Asian-American to be elected to chair a city community board. Li has been involved in advocating for services for families and children. Lee is a technology executive with a long history of community activism. He got his start in politics in the Koch Administration and is now running as an outsider candidate. The void left by Silver is immense as he brought billions worth of pork to the district over the decades, used his power to micromanage almost all changes in the district, and stood as a champion for many liberal causes. At the same time, many in Albany saw Silver as a long-term impediment to state government ethics reform and to policy reforms that could have positively impacted his district, especially on affordable housing. The federal corruption charges against Silver revealed his close financial ties to the real estate lobby that he swore he was fighting during Albany negotiations over rent control and other major housing issues. While many expected Silver’s conviction to bring real change to Albany the special election to replace him was a sign to many across the state that there were still plenty of roadblocks in place. When Manhattan Democrats gathered to back a candidate for the empty seat, Silver’s allies maneuvered to ensure that Cancel got the nod. Special elections in New York remain largely controlled by local party committees. Niou and her supporters protested the selection process and campaigned against Cancel with the backing of the WFP, which is supporting her again. Other candidates plotted for their current runs. 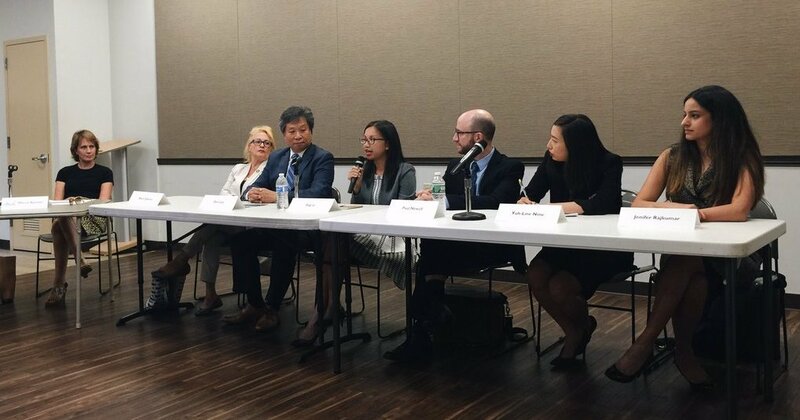 This crop of candidates for the 65th will be looking to tap into voting bases across a district that includes Chinatown, the Lower East Side. and most of Lower Manhattan. Political consultants expect that the district’s powerful Asian vote, which could have been tapped as a bloc by one candidate, to be splintered, making the race less easy to predict. Top issues facing the district include affordability, especially in housing, as well as education, including school space, climate resiliency, senior services, and health care infrastructure. There is also, of course, a lot of discussion of government ethics and state government reform. Gotham Gazette spoke to all of the challengers about the race, but attempts to secure an interview with Cancel were unsuccessful. Candidates painted a picture of a district where elderly residents are finding it harder to afford to stay, where immigrant families can’t afford more than one bedroom, and where properties owned by the New York City Housing Authority (NYCHA) are in constant disrepair. Meanwhile, Gov. Andrew Cuomo and the Legislature managed to put aside $2 billion for affordable housing and supportive housing, but have yet to actually allocate spending for most of that sum. Niou said it must be a priority to get the money out of the state’s coffers and into districts. Asked about Cuomo’s plan to revive the expired 421-a tax break for developers who agree to build a certain percentage of affordable housing, Niou was skeptical. “Affordability is a huge issue for our district and the thing is you can't lose money building apartments in Manhattan,” she said, noting the escalating cost of rent. Niou said that if 421-a is necessary checks must be in place. “We need to make sure developers pay workers the proper wage and make sure we are actually getting affordable units,” Niou said. She also advocated reopening discussions over rent regulation laws to end practices that incentivize landlords to push tenants out. Meanwhile, Li said the state needs a multi-pronged approach to affordable housing. “We can't just throw money at new development to solve the affordability issue,” she said. “We need preservation. Repairing NYCHA properties and dealing with sustainability must be a priority, but it is important we build new apartments.” She added that she believes it is time to alter the Urstadt Law that gives the State say over major city issues in order to give the City more power. Newell said his district faces an “acute capital need” as far as housing goes, citing the disrepair of NYCHA properties. “We obviously need to continue building to meet our housing demands, but not I’m sure we need 421-a, with or without a wage subsidy.” He said that he would favor increased checks on the subsidy program to ensure developers are actually delivering the affordable units they receive breaks for. Asked how she would preserve affordable housing at a recent debate, Cancel responded: “To be very honest with you, I don’t know the answer to that question, in terms of how do we stop what’s going on,” before suggesting rezoning might help, according to The New York Times. Rezoning is under purview of the City Council. Newell said flatly that he opposes the tax credit. Niou, who noted that Cuomo supports the credit said, “The Governor wants lots of things but he hasn't paid us for the CFE case yet,” referring to the Campaign for Fiscal Equity lawsuit that resulted in a judge saying the state chronically underfunds the poorest schools. “So he owes public schools, so it is ridiculous to give breaks to people who support private schools when public schools are suffering,” Niou said. Lee said he was concerned that people who make donations not be allowed to dictate how the money is spent. The candidates also all came together on the need to save local health care providers given the closing of Beth-Israel Hospital. They were also concerned about resiliency issues the city was forced to confront during Superstorm Sandy. Li said she discovered while campaigning that many residents of the district don’t realize they are eligible for health care and other benefits under the Federal Zagroda Act. Li and Niou said that they saw a desperate need in the district for constituent service efforts to connect residents with government programs. All of the challengers to Cancel professed to support a list of government ethics reforms that include limiting or banning outside income for legislators, implementing a statewide system of public campaign financing similar to that employed in New York City; ending the LLC loophole; and adjusting the budget process to make it more open and inclusive. They differed less on what they wanted done and more on how they would achieve it. Rajkumar said she believes individual Assembly members and committee chairs need more individual power. She also wants lobbying on legislation to be revealed in a database in real time. Lee said voters are tired of waiting for the system to change. “These guys see problems and they say ‘let's kick it to the next election cycle.’ They have no sense of urgency. They are so out of touch and expectations have gotten to be so low. The bigger issue is that we need true reform - not fresh blood but a blood transfusion,” Lee said. Asked about the differences between challenging Silver and 2008 and running in a crowded field in 2016, Newell first said the difference is “we are going to win,” but added having a crowded field of deeply invested community members means that the district will have the first “healthy debate process” it has had in decades. As for campaign funds to support stretch-run efforts, Cancel reported having $11,581 on hand as of her 11-day pre-primary filing. Other candidates have significantly more money for final flyering and other advertising and get-out-the-vote efforts. Endorsements from unions, elected officials, and other groups have also been divided, mostly among Cancel’s challengers. Rajkumar reported having $182,826 on hand in her 32-day pre-primary filing; her 11-day pre-primary filing has not been posted by the BOE. Rajkumar has been endorsed by The Public Employees Federation and Citizens Union of New York, a government reform group. Newell reported having $92,347 on hand as of his 32-day pre-primary filing. He has been endorsed by the United Federation of Teachers, New York State United Teachers, Citizen Action of New York, and City Council Members Rosie Mendez, Mark Levine, and Ben Kallos. Niou reported having $76,635 on hand in her 11-day pre-primary filing. Along with her endorsements from The New York Times and The Working Families Party, Niou is supported by City Comptroller Scott Stringer, state Senator Daniel Squadron, and others. Li reported having $36,404 on hand as of her 11-day pre-primary filing. She has been endorsed by City Council Speaker Melissa Mark-Viverito, City Council Members Margaret Chin and Helen Rosenthal, and state Senator Jesse Hamilton. Lee reported having $31,856 on hand of his 11-day pre-primary filing. Any good democracy should reflect a society’s diversity in its leadership. The undemocratic way in which the 65th Assembly District special election is unfolding should galvanize all communities, particularly underrepresented ones, to push for reforms and encourage underrepresented New Yorkers to be more civically engaged. America does not always have accurate and inclusive representation in government. This is especially true in state legislatures. A few weeks ago, a study released by the New American Leaders Project found several distressing trends. Although 38% of the U.S. population identifies themselves as people of color, only 6% of state legislators come from such a background. Furthermore, the New American Leaders Project’s survey of non-white legislators found that during some of their campaigns, they were actively discouraged from running by their own political party. This problem is painfully apparent in New York. For the past 40 years, Sheldon Silver ruled over the 65th Assembly District, commonly referred to as a majority-minority district. This district includes Chinatown, a neighborhood that has steadfastly served as the epicenter of growth and opportunity for many Asian immigrants since the 1900s. Silver is said to have had a vice-like grip on his seat, and only released his hold when the courts forced him to leave upon a federal corruption conviction. His departure and the subsequent special election should have given New Yorkers the opportunity to vote for new candidates who actually reflect their community. However, residents of the district were robbed of that opportunity. Since the announcement of the special election, the deck was stacked against any possible candidate outside the local political machine, one which Silver still controls. On January 30, despite the protests of the media and good government groups such as Common Cause New York, a special election date of April 19 was announced, which was five months earlier than the strongly suggested September 13 New York State primary date. Just a few hours later, local blogs and newspapers revealed that the Democratic County Committee, a subset of the state Democratic Party, would determine the Democratic nominee for the special election in one week, effectively ending an election just seven days after its start. The candidate the local county committee selected on February 6 was Alice Cancel, the wife of the Democratic County Committeeman and political club boss of the Lower East Democrats, John Quinn. Cancel has had no qualms praising Silver. The election in April will be a farce, with only one name on the Democratic ballot line in a district where Democrats outnumber Republicans 8 to 1. Come fall, the Democratic pick will have an incumbent advantage, and Chinatown may once again be represented by someone who has not democratically earned the right to do so. This is a mockery of American democratic values, and we must all act to ensure it does not happen again. There are two ways we as concerned citizens can do so. First, push to adopt the policy recommendations from Citizens Union’s 2013 report on political clubs to curb excess influence over institutions like the Democratic County Committee. The report found that the financial and personal ties within and among political clubs, machines, and individual politicians were suspect and strong. For example, during the 2011 federal trial of former City Council member Larry Seabrook, it was discovered that he had used the Northeast Bronx Democratic Club as his personal ATM. To fix this, Citizens Union recommended that a political club’s financial activities be transparent and regulated. Citizens Union recommends, among other things, defining precisely what constitutes illegal coordination between political clubs and candidates’ campaigns. Secondly, underrepresented communities must become more civically engaged. During the midterm elections in 2014, Asian-American voter turnout was abysmal—only 4% of the eligible population voted. We can and must do better. Civic engagement does not start or stop at the polls. Being engaged means joining a community board, voting in primaries, participating in candidate forums, reading political news, and joining organizations that advocate for people’s rights. 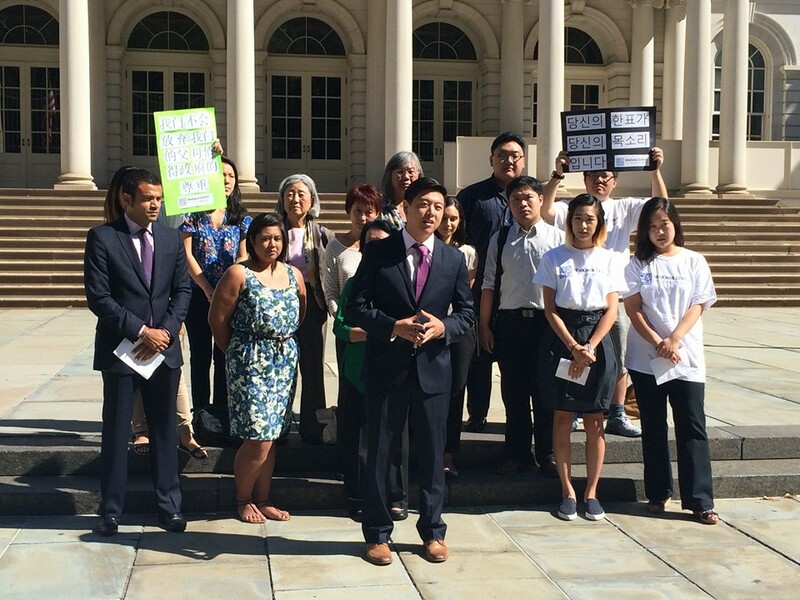 What has happened in Chinatown proves that now is the time for our underrepresented communities to get involved and make a difference. Serin Choi is the Advocacy Chair for the Korean American League for Civic Action, a non-partisan non-profit organization that advocates for increased Asian leadership in the public sector.